Those who are not upset by the “loss” of faith—something once taken for granted or endured has been left behind—commonly say instead, “I didn’t lose my faith. I saw through it.” They don’t face a ‘god-shaped hole.’ They are closer to embracing the human experience honestly. I was a latecomer at seeing through the Christian fog. I made it all the way to graduate work in seminary before I snapped out of it. A couple of offhand remarks by professors shocked me into awareness of major fallacies. I was lucky, but why hadn’t I wised up much earlier? For those who have been urged, from toddlerhood, to love and embrace faith, making the break usually never happens at all. Surely that is misuse of the word evidence, i.e., something is true because faith says so. Who would take that seriously? 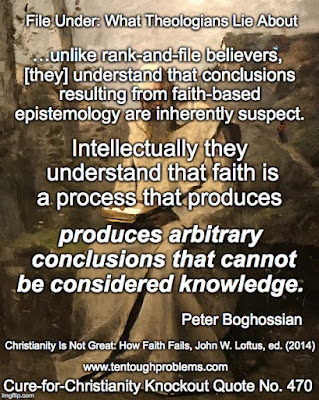 Peter Boghossian sheds light on this phenomenon in an essay included in John W. Loftus’ 2014 anthology, Christianity Is Not Great: How Faith Fails. 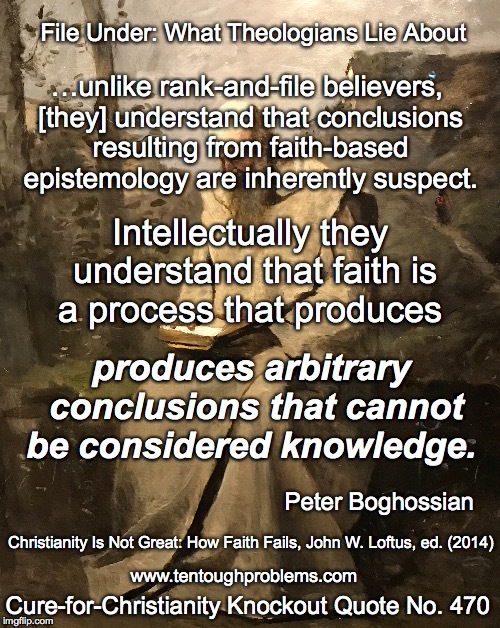 The essay is titled, “Faith, Epistemology, and Answering Socrates’ Question.” It is an eloquent plea for honesty—and Boghossian reveals that he was shocked to find out that there really are fideists, those who argue that faith counts as evidence. For some of us, doubt starts early, and Boghossian reports that he received a jolt in the sixth grade. A Jewish girl in his class whispered to him: “My dad told me not to tell anyone there’s no Santa. He said Christian kids would get upset.” Christians, it seems, are especially allergic to myth busters. I was gratified that he mentioned this particular weak link in the Christian chain. If only the apostle Paul had mentioned an empty tomb! His certainty about the resurrection came from his visions, so an empty tomb was irrelevant. The four gospels do not agree about what happened at the tomb on Easter morning. Nor is there an account of the resurrection itself. We suspect that folklore grew with the telling, especially since Mark’s account—the first to be written—came some forty years after the “events” described. Yet conservative scholars have worked overtime to assure the faithful that the gospels provide evidence. Boghossian is quite right that such scholarship is “…frankly, too tedious, too disingenuous, and too corrupted by confirmation bias to deserve serious intellectual consideration.” (p. 81). ‘That’s not how Spock used that word in Star Trek episode #10, ‘The Corbomite Maneuver,’ and episode #52, ‘The Omega Glory’. Clearly, you’ve not read the surrounding literature in Whitman Books, Wanderer Books, Archway Paperback, etc. And if you had read Shatner’s Dark Victory then you’d never have that interpretation. You need to deepen your understanding before you can speak meaningfully about such issues. But such honesty is beyond the reach of preachers and priests precisely because of faith. I’ve seen it countless times as well with laypeople who seize up with fear—even panic—at the very idea that their beliefs might not pass muster, and they don’t want to go there: “I believe it, I’ve always believed it, my parents believed it. It’s the faith of our fathers, so it must be true.” Faith is the evidence. We see it also in the responses of the apologists who haunt the Debunking Christianity Blog. No matter the evidence and rational arguments presented, they can’t absorb them. They display the brain damage that comes in the wake of faith.